CINCINNATI -- Cincinnati Shakespeare Company is ready to show off during its first season in its new $17.5 million home, with flying fairies, large and innovative sets and plenty of behind-the-scenes tours. The Otto M. Budig Theater at the corner of 12th and Elm streets replaces the cramped, converted movie theater on Race Street, and Cincinnati Shakespeare is making the most of the upgrade. The first show of the season, “A Midsummer Night's Dream,” includes aerial flights for Puck and his fellow fairies — a trick that never could have happened at Cincy Shakes' old home. “Dracula” will fly, too, and the season ends with “Noises Off,” a farce that requires a two-story, revolving set. Another public open house is planned for Aug. 25. People can walk the upper gallery halls and peek through the windows that reveal the company's stage shop. They can grab a drink at the multi-sided bar in the spacious lobby and see how many Shakespeare quotes they can find hidden around the building. They can test the seats — all of them are within 20 feet of the stage — and check the legroom. 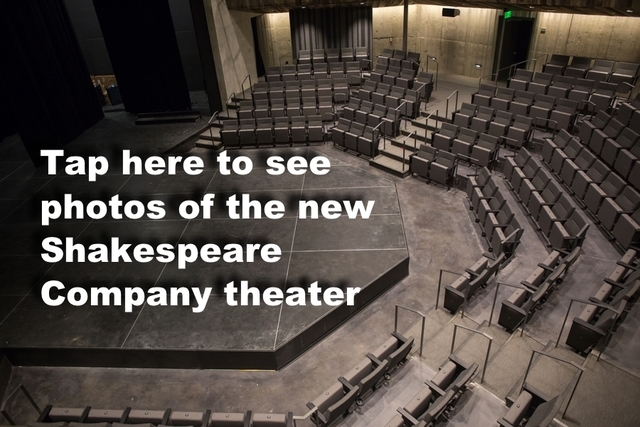 Click here to see inside Cincinnati Shakespeare's new theater. Cincinnati Shakespeare's 24th season will kick off Sept. 9 and 10 with the opening weekend of “A Midsummer Night's Dream.” The production, directed by Phillips, begins quietly, with black curtains hiding the 15-foot-tall sculpted playground of a set. “But first, as people are sitting, there'll be a single ghost light on stage, so you can just take in the room,” Phillips said. The new theater gives Cincinnati Shakespeare literal room to grow and challenge itself. At the old theater, sets had to be built in parts so they could go through a standard door. The rehearsal space couldn't fit an entire cast at once. The company was only the fifth in the United States to complete Shakespeare's canon, yet its facility never could have hosted the Shakespeare Theatre Association conference, as it will in January, bringing national and international visitors to Cincinnati. But the new space also changes the atmosphere for Cincy Shakes' audience. Although there's nearly double the 150 seats of the old theater, each one is near the stage, and the rows wrap around the stage. The company has sold $50,000 more in ticket subscriptions than its goal, and 25 percent of the buyers are new subscribers, said marketing director Jeanna Vella. Several shows already are sold out — a rare thing to see before a season begins — although seats still remain available for every production. “We also have standing room, so anyone who's wanting to join us, we'll find a way to get them in,” Vella said. You can see Cincinnati Shakepeare's commitment to making Shakespeare and theater available to everyone in the design of its new home. There's classroom and training space, interior windows throughout the building that let people see behind the scenes, and a Juliet balcony that opens onto the sidewalk and allows for small public performances. The rehearsal space has floor-to-ceiling windows that overlook Washington Park. “We didn't want people to be intimidated by Shakespeare,” Downing said. “If people can see what's going on inside, they're less likely to be intimidated. 3-7 p.m. Aug. 13: Family Festival presented by ArtsWave: Before you see Cincinnati Shakespeare Company's free performance of “Romeo and Juliet” in Washington Park at 7 p.m. Aug. 13, stop by the new theater for a tour, including access to backstage spaces. There will be activities for children of all ages and performances from a variety of arts groups and collaborators. 6-11 p.m. Aug. 25: Final Friday and Classical Arts Corridor Party: Over-the-Rhine's Final Friday celebration extends to Elm Street to celebrate the opening of the Otto M. Budig Theater. Cincinnati Shakespeare Company's new theater will be open to the public, and the party will include performances, food and drinks. Sept. 9-10: Grand opening weekend: Got tickets to one of the opening weekend performances of “A Midsummer Night's Dream”? You're also invited to a pre-show open house with behind-the-scenes tours, refreshments and festivities. The open houses are 11 a.m.-1:30 p.m. before the 2 p.m. matinees on Saturday and Sunday, and 5-7 p.m. before the Saturday evening performance. Tickets still are available at www.cincyshakes.com. “A Midsummer Night's Dream,” Sept. 8-30: Puck and some of his fellow fairies will fly. This bit of stagecraft was impossible at the old theater. “Dracula,” Oct. 13-Nov. 4: More flying! And this adaptation will move like an action movie. “The Adventures of Tom Sawyer,” Nov. 17-Dec. 9: This will be the first time Cincinnati Shakespeare presents a play based on work by Mark Twain. “Every Christmas Story Ever Told (And Then Some! ),” Dec. 21-31: This will be the 12th anniversary of this holiday classic. “Guess Who's Coming to Dinner,” Jan. 26-Feb. 17: It has been 50 years since the film version, starring Sidney Poitier. The audience will be asked to consider how our ideas about inclusion, marriage and family have changed since then. “Othello,” March 2-24: Presented in a contemporary setting, this tragedy will show why Shakespeare remains relevant. “Cat on A Hot Tin Roof,” April 6-28: Tennesee Williams' play about one man's struggle with his identity is as provocative as it is timeless. “Noises Off,” May 18-June 9: The production's two-story, revolving set would have been impossible in the old theater.